YOU MIGHT WANT TO READ THIS IF YOU OWN A POOL. Anyone who lives in Northern Territory knows that having a pool can improve the quality of your life. Installing artificial grass can improve the quality of your life, too. In fact, once you make the move to faux lawn, you’ll have a lot more time to enjoy your pool. And more money to invest in splashier pool toys for the kids, more towels to dry the dog, and that outdoor kitchen you’ve been contemplating. Quite simply, pools and artificial grass are a match made in heaven. Most pools have a hardscape surface around their perimeters, such as concrete or brick. Regardless of the material, it can get so hot it burns your kids’ bare feet (yours, too). In fact, it heats up the entire surrounding area, taking the enjoyment out of sunbathing or simply relaxing. Splashed water makes hardscape surfaces slippery, increasing the likelihood your kids will fall and hurt themselves while dancing around to avoid the hot surface. This is no fun! Artificial grass is soft underfoot and never slippery, no matter how many cannonballs your family can produce. It drains fast and dries fast. You can install artificial grass right over the top of that hard, hot, boring surface, creating a seamless transition from lawn to pool. With artificial grass, you can skip the annoying clippings and other debris that inevitably makes its way into your pool. Not to mention mud. And you won’t have to worry about lawn maintenance chemicals making their way into the water, either. Aside from all the practical considerations, why surround a beautiful, inviting pool with something essentially ugly? Artificial grass is the essence of pretty. Its lush texture and emerald color compliment your pool and enhance your entire landscape. Not only that, even in winter when the pool is not in use, that area will continue to look green and vibrant. 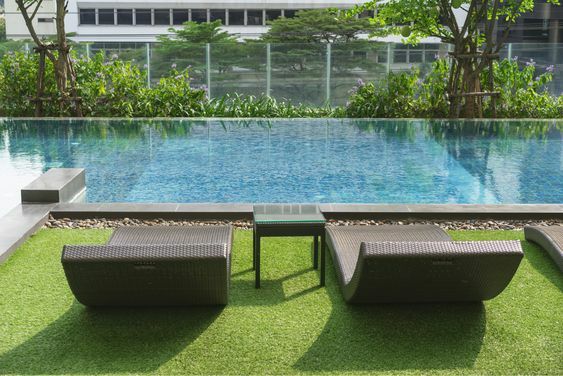 Artificial grass adds grace and beauty to more than swimming pools, too. Your yard may include a lovely pond with koi or a fountain as a water feature. A grassy surround or pathway will draw the eye to this special aspect of your landscaping. Just put a kids’ wading pool on your lawn. No reason to gasp, “OMG, it will wreck the grass!” Artificial doesn’t just look perfect, it’s tougher than natural grass. Leaving a pool on live grass in the sun all day can severely damage it, even roast it to death. When you empty it at the end of the day, you get a different kind of pool that can take forever to sink in. Faux grass will happily accommodate the pool and quickly drain away water when you dump it out at night. 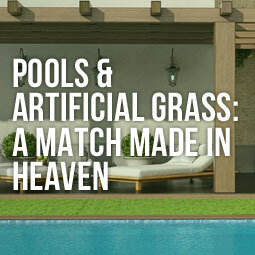 What else makes pools and artificial grass a heavenly match? 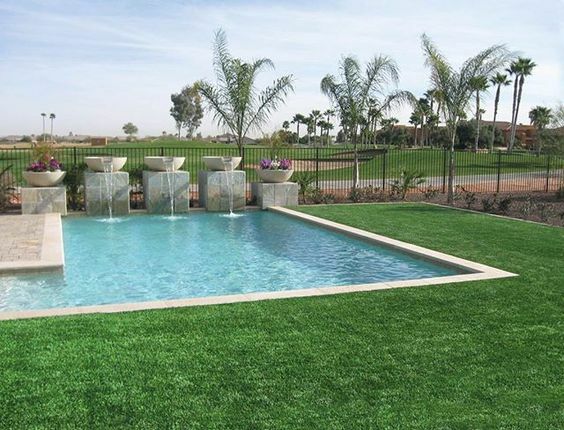 This entry was posted in Articles, Landscaping and Synthetic Grass, Swimming Pools & Synthetic Grass and tagged artificial grass installation, swimming pool, synthetic grass by jordan1. Bookmark the permalink.